Partly cloudy skies this evening will become overcast overnight. Low 54F. Winds SSE at 10 to 20 mph..
BLOOMINGTON — Bond was set at $1 million on Thursday for a Rantoul man, charged in connection with the alleged drug-induced homicide of another man in McLean County. Troy D. McBride, 24, was indicted June 8 by a statewide grand jury meeting in Lee County. The seven-count indictment charges McBride with delivery of the drugs that caused the death of James Dingman, 41, of Bloomington. After a bond hearing Thursday, Assistant State's Attorney Jeff Horve said heroin and fentanyl were the drugs that caused Dingman's death. Drugs were found at the scene where he died, said the prosecutor. Additional details were not discussed at the hearing. 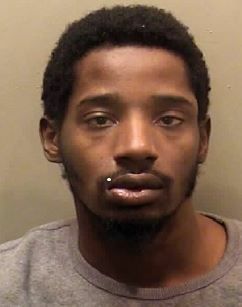 McBride, who is employed at a Rantoul factory, was arrested Wednesday in Urbana by BPD's vice and street crimes units, and Campaign's street crimes task force. McLean County Associate Judge Amy McFarland denied a request from a McLean County public defender to lower McBride's bond that requires him to post $100,035 to be released. According to Horve, a member of the victim's family may want to provide a victim impact statement if a hearing is held on the issue of bond. The judge approved a request from the state that requires McBride to prove that the source of any bond he posts is from a legitimate source. The McLean County States Attorney's Office assisted in the investigation that began March 23 when McBride was pulled over for a traffic stop in Urbana, said a Bloomington police statement. McBride also was indicted on six counts related to the manufacture/delivery of a controlled substance. BPD jointly investigated the case with Champaign police who recovered heroin, fentanyl and crack cocaine during the initial traffic stop, said BPD. Drug charges were dismissed in Champaign County Thursday after the McLean County case was filed against McBride, said Horve. The felony arrest is the second drug-induced homicide case filed in McLean County since 2016. The arrest prompted BPD to include a message that if anyone knows of someone who is battling drug addiction, they should call local treatment agencies at 309-827-6026 or 309-888-0993. Look for The Pantagraph at the following Central Illinois locations.